Blessings are mentioned specifically over 400 times throughout the Bible and implied many more. No wonder Christians use the term freely in their walk with God. Prayers are filled with asking God to bless our children, grandchildren, spouses, parents, relatives, friends, co-workers and so on. We sign our cards with “God bless” and use phrases like “Have a blessed day.” There is no better word to describe God’s goodness towards us and hopefully we thank him daily for our blessings. However, I think it’s also important that we be a blessing to others. When God told Abraham to leave his country, God told him what he would do. “I will make you a great nation. I will bless you. I will make you a great name and you will be a blessing.” (Genesis 12:1, 2) The NLT says, “…and you will be a blessing to others.” I meditate on that scripture a lot. Am I a blessing to others? We know it is more blessed to give than receive. (Acts 20:35) We know that we should share our blessings with others. (Matthew 10:37) But I think being a blessing to others goes deeper than that. A blessing is something conducive to happiness, good fortune, or a godsend. Do people feel better or blessed just being around us? Or would they rather hang out with someone with a brighter outlook on life? Being a blessing to others is not contingent on everything going right in our lives. When Paul and Silas were imprisoned they chose not to curse their situation. They still praised God. Their example blessed the other prisoners and the prison guards. (Acts 16:25-31) Sometimes our actions during times of adversity can bless others and we won’t even know it. If we yield to God, he can do miraculous things through us that we are totally unaware of. 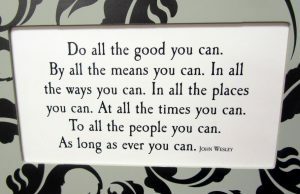 One final thought… The world would be a better place if we adopted John Wesley’s philosophy.